Just because you have children, pets and a hectic schedule doesn’t mean you have to sacrifice style. There are many resources available to help you achieve a great design that can withstand everyday wear and tear. One of the most important “tools” for this type of demanding design is fabric. Most manufacturers now offer indoor/outdoor fabrics that have come a long way in terms of look and feel. While people may think of Sunbrella or awning striped patterns when outdoor fabrics are mentioned, the options have progressed to offer beautiful and interesting selections that are appropriate for any room in your house. Manufacturers like Schumacher, Kravet and Cowtan & Tout have acrylic and/or nylon fabrics perfect for kitchens, family rooms, living rooms and bedrooms. 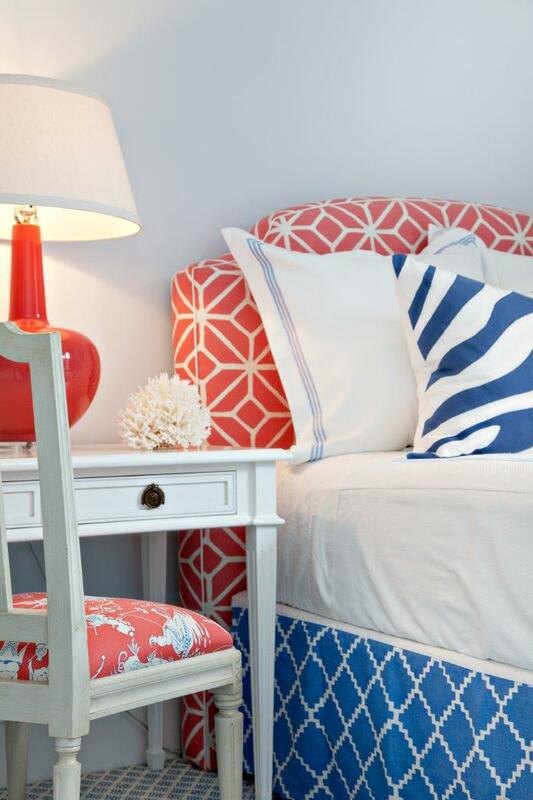 For example, the bedroom photo shows a headboard with a printed coral geometric pattern from Schumacher that is 100% acrylic. The dining room photo shows a soft blue acrylic dining chair seat fabric from Lulu DK with a Kravet indoor/outdoor trim. Both images demonstrate how the fabrics and trims are perfect complements to the design of the rooms while offering the homeowners cleanable, stain and soil repellent surfaces for ease of maintenance. For those concerned about the health properties of these products, there are now topical stain resistant spray applications for fabrics and carpets that are eco-friendly. These products can provide 3-5 years of protection, and many of these companies also offer stain removal services if needed. With thoughtful specifications and proper maintenance a family home can be elegant while holding up to the everyday challenges of children and pets. We all know spills and accidents will happen. These solutions can help you clean and maintain your furniture so it looks great every day, for years to come.